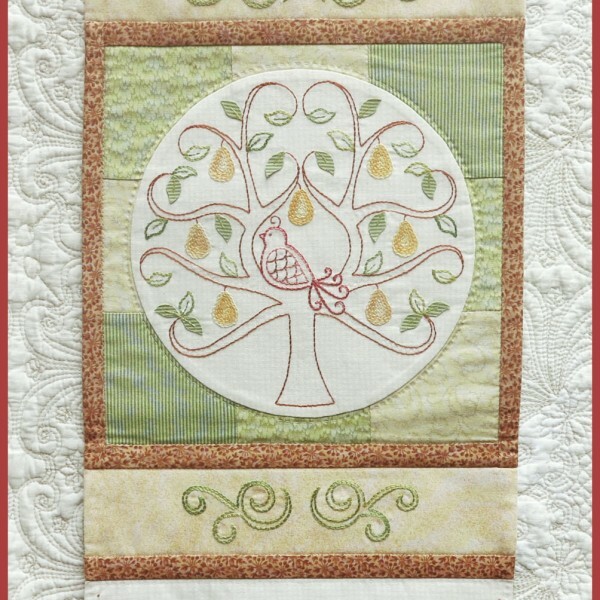 The central panel features a pretty, embroidered partridge nestled in a pear tree with chain-stitched pears and fabric leaves. 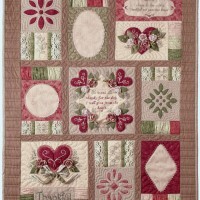 This small wall hanging is completed with the addition of some simple patchwork and a lovely semi-circular panel, displaying a large pear with dimensional leaves and a well known line from a much beloved Christmas carol. 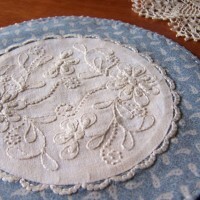 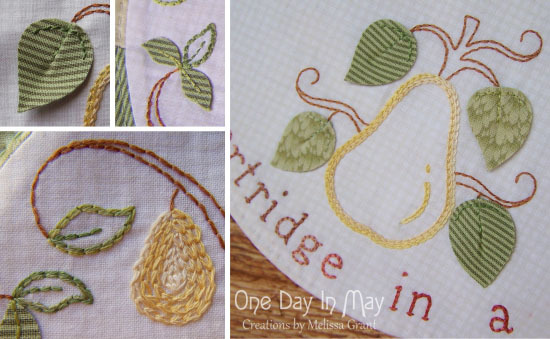 Back-stitch, chain-stitch and a few French-knots are the only stitches used to create these pretty pear panels. 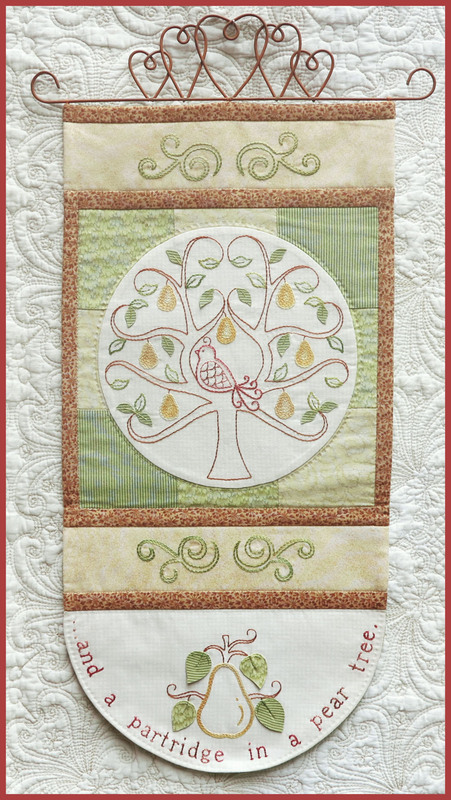 “In a Pear Tree” is the perfect project for those who like to combine their love of embroidery with patchwork and dimensional features. 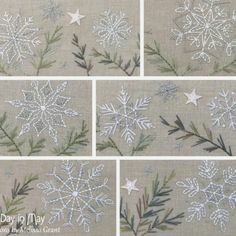 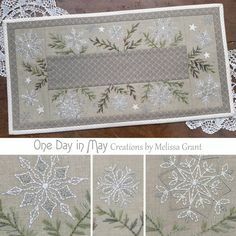 This One Day In May design can be created with Christmas themed fabrics to add to your festive decor, or in softer tones for all-year display. 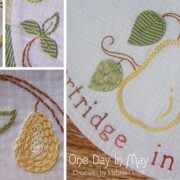 The “In A Pear Tree” pattern features comprehensive instructions with an abundance of photographic detail. 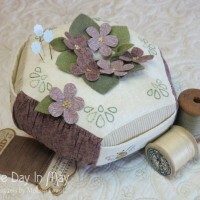 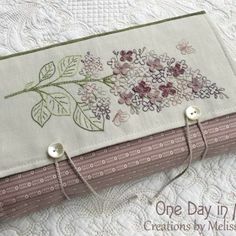 You will also find full-sized pattern sheets and stitching and needleturn appliqué guides. 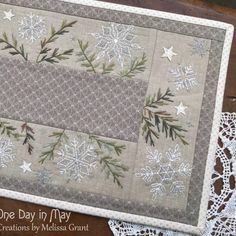 This sweet design, combining embroidery, patchwork and dimensional fabric leaves, celebrates the humble charm of the pear and the Christmas carol we all know and love.